Preventing nontraumatic fractures in millions of patients with osteoporosis or metastatic cancer may significantly reduce the associated morbidity and reduce health-care expenditures incurred by these fractures. Predicting fracture occurrence requires an accurate understanding of the relationship between bone structure and the mechanical properties governing bone fracture that can be readily measured. 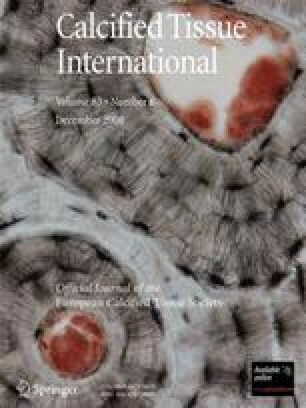 The aim of this study was to test the hypothesis that a single analytic relationship with either bone tissue mineral density or bone volume fraction (BV/TV) as independent variables could predict the strength and stiffness of normal and pathologic cancellous bone affected by osteoporosis or metastatic cancer. After obtaining institutional review board approval and informed consent, 15 patients underwent excisional biopsy of metastatic prostate, breast, lung, ovarian, or colon cancer from the spine and/or femur to obtain 41 metastatic cancer specimens. In addition, 96 noncancer specimens were excised from 43 age- and site-matched cadavers. All specimens were imaged using micro-computed tomography (micro-CT) and backscatter emission imaging and tested mechanically by uniaxial compression and nanoindentation. The minimum BV/TV, measured using quantitative micro-CT, accounted for 84% of the variation in bone stiffness and strength for all cancellous bone specimens. While relationships relating bone density to strength and stiffness have been derived empirically for normal and osteoporotic bone, these relationships have not been applied to skeletal metastases. This simple analytic relationship will facilitate large-scale screening and prediction of fracture risk for normal and pathologic cancellous bone using clinical CT systems to determine the load capacity of bones altered by metastatic cancer, osteoporosis, or both. This study was funded by National Institutes of Health grant CA40211 (to B. D. S.), Susan G. Komen grant BCTR0403271 (to B. D. S.), Swiss National Science Foundation grants FP 620–58097.99 and PP-104317/1 (to R. M.), and a Fulbright Full Grant for Graduate Study and Research Abroad (to A. N.). The authors acknowledge Dr. Marc Grynpas for BSE microscopy imaging, Dr. Zaifeng Fan for nanoindentation, Dr. Andrew Rosenberg for providing histological confirmation of skeletal metastasis in bone specimens, and Dr. Martin Stauber for assistance in image visualization. Additionally, they acknowledge Dr. Evan Snyder from Burnham Institute for Medical Research for reviewing the manuscript and providing helpful comments.